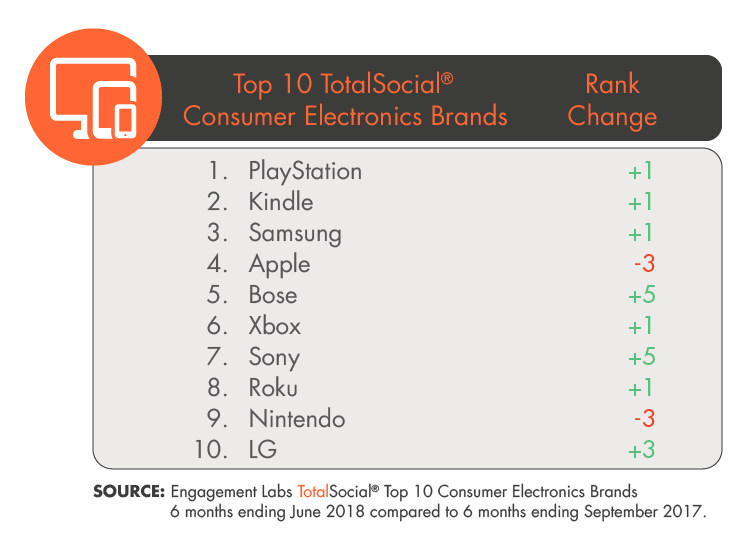 NEW YORK, NY (September 27, 2018) – Engagement Labs (TSXV: EL) (OTCQB: ELBSF), an industry-leading data and analytics firm that focuses on the entire social ecosystem and its impact on business, today released its TotalSocial® ranking of the top consumer electronics brands in the U.S. based on social influence. Sony’s PlayStation, benefiting from the enormous popularity of the game Fortnite: Battle Royale, claimed the number one spot as its online sentiment increased. This score indicates consumers are talking positively about the brand in social media. More than 125 million people worldwide are playing Fortnite: Battle Royale, and the game is the top grossing title on consoles, according to SuperData Arcade. This popularity has contributed to a higher number of positive conversations about PlayStation. In addition, a PS4/Fortnite bundle kit hit the market in late August, further driving buzz. Meanwhile, Bose jumped five spots to fifth in the rankings. Its online sentiment and offline influence scores increased, as did online brand sharing, which measures the number of consumers sharing the brands’ marketing campaigns via social media. The brand’s noise-cancelling headphones have received rave reviews, and its newly released noise-masking sleepbuds appear to be following the same trajectory. Designed to promote better sleep, the new headphones are already in high demand. Nintendo took a three-spot dive in the rankings to number 9 due to sharp declines in both offline and online influence. At the recent E3 conference, the annual event for video games and consoles, the brand’s announcements failed to impress media, analysts and even investors, as its stock price plunged shortly after. Computer maker ASUS experienced the biggest drop in the category, plummeting 17 spots to number 22. Although the brand’s scores weakened across the board, its online and offline influence scores performed significantly worse than any other measure. The brand faces intense competition, as Apple recently surpassed it in the notebook market. In addition, PC sales are on a downward trend.